Larus cachinnans hybrid? 4CY 8L2B November 28 2012, Deponie Pohlsche Heide - Minden, Germany (52°23'05N, 08°46'45E). Picture: Armin Deutsch. 8L2B yellow and metal Kaunas EN03324 (LIK), ringed as pullus on May 23 2009 at Kretuonas, Lithuania (55°14'45" N, 26°04'45" E). Bird from mixed colony "argentatus". 23-5-2009 Kretuonas pull 55°14'45" 26°04'45"
Bird in all respects very adult-like, except maybe for the large amount of black on the bill. From mixed colony; Long call like cachinnans, but not typical, somewhat like Herring Gull-like (but faster and not so nasal), short primary projection, rounded head shape and fine streaking all over head and hindneck may indicate influence of Larus argentatus parent, but overall this bird recalls cachinnans. See also 2L1C and 8L9B. Image below: together with adult Larus argentatus. below: underwing pattern on P10 very nicely matching cachinnans. 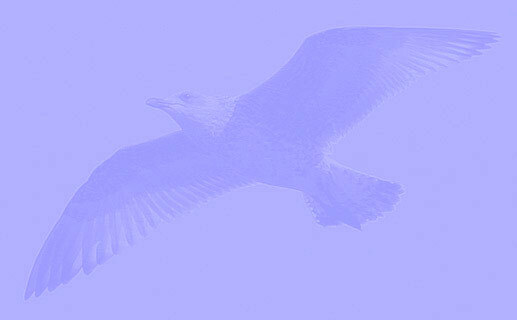 below: with 1CY Larus michahellis. below: fighting with 1CY Larus cachinnans.